We are going through yogurt like crazy. I have been making a half-gallon batch about once every ten days, using it in smoothies, eating it straight with a dollop of pineapple curd, even marinating chicken in it for dinner. So far we have been very happy with the results of using the raw milk for this; I have been more diligent about refreshing the culture with some plain organic storebought yogurt every few weeks, and noticed that using Brown Cow made a much smoother yogurt with very little whey compared to Safeway’s Open Nature organic Greek yogurt, which gave us cups and cups of whey and an unpleasantly chunky texture. Unlike my standard version of banana bread, this recipe calls for buttermilk and I opted for my usual 50/50 milk/yogurt substitution. 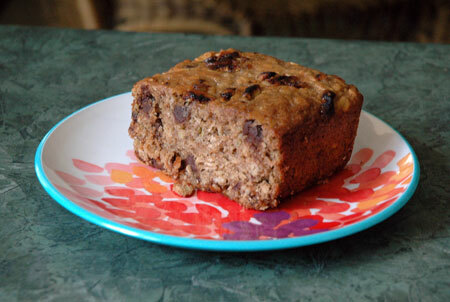 Loaded with chocolate chips and oatmeal, it has a moist, hearty texture, and I might actually like it slightly better than the one I grew up with (but don’t tell my husband!). With twice the banana bread for the same number of bananas, you can hardly go wrong. The oats give it a slightly healthier feel too, although I seriously doubt that is actually the case, considering all the chocolate chips! Preheat oven to 350F. Prepare two 9×5 inch loaf pans; set aside. In a large bowl, whisk together flour, oats, baking powder, baking soda, cinnamon, and salt. In a measuring cup, mix together buttermilk and vanilla. In the bowl of a stand mixer, cream together butter and sugars until light; add eggs one at a time, followed by bananas. Alternate flour mixture and buttermilk mixture in thirds until just combined. Stir in chocolate chips. Pour batter into prepared pans and bake at 350F for 45-50 minutes until a toothpick inserted comes out clean. Or make muffins by dishing into individual muffin wells and baking for 20 to 25 minutes. Source: Slightly adapted from The Pioneer Woman’s Tasty Kitchen.